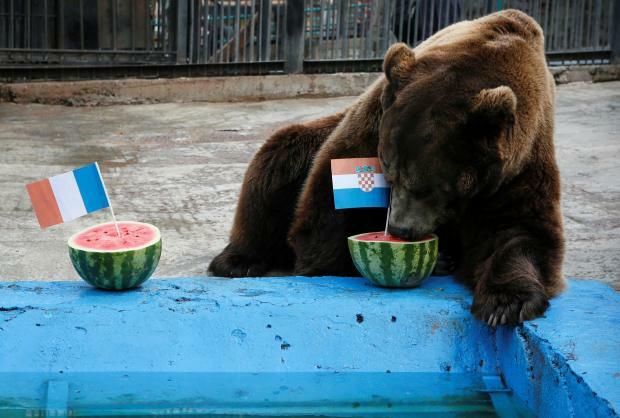 Buyan, a brown bear kept in a Siberian zoo, has predicted that Croatia will defeat France in Sunday's World Cup final. Two halves of water melon were laid on in Buyan's enclosure in the Royev Ruchey zoo in the Siberian city of Krasnoyarsk. One half of the melon had a small French flag planted in it, while the other had the Croatian flag sticking out of it. Buyan, a male Siberian brown bear, sauntered up to the water melon halves, momentarily sniffed at the French one, before shuffling across to the Croatian water melon. He then proceeded to sit down next to it and munch away enthusiastically. Buyan is one of a menagerie of animals in host country Russia that have predicted the outcome of World Cup games, with rivals including Sochi's Harry the otter, Samara's white goat Zabiyaka, St Petersburg's cat Achilles, Kaliningrad's hippos Milya and Glyasik and Nizhny Novgorod's tapir Cleopatra. Their predictions have not always been accurate. A Croatian victory would be a huge upset, with France firm favourites to win the World Cup for a second time.